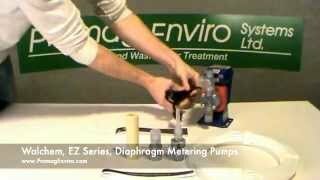 Similar Diaphragm Metering Pumps are on our Walchem EZ Series Diaphragm Metering Pump page. 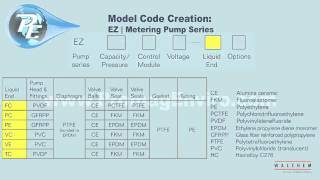 A complete listing is available on our EZ Models page. Advanced microprocessor control and a turndown ratio of 360:1 make this series an exceptional value. The pumps are simple to operate with only three pushbutton keys and the unmatched turndown ratio provides both versatility and high resolution chemical feed which eliminates slug-feeding effects. The optional EZ-Timer module integrates Walchem’s EZB technology with a versatile programmable timer. Timed feed control can be programmed in daily or weekly cycles. The weekly schedules can be programmed in either 1 or 2-week cycles with a daily on-time. The daily timer can be set for multiple daily on-times. On-times are set in minutes (0-999). 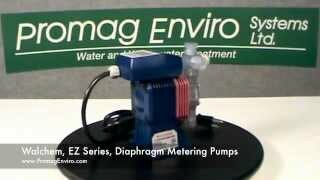 Promag Enviro provides free shipping throughout Canada and the U.S.
Can I use the EZ pump to produce an output based on water flow rate? Yes. You first need a flow meter that sends a digital signal such as the MJN series, IP series, or any flow meter with an output less than 1000 Hz. Then you send the signal to a pulse accumulator such as the PT35. 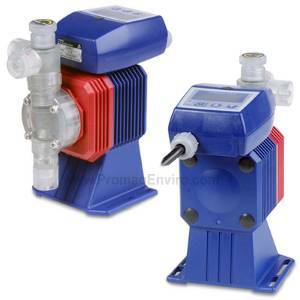 The PT35 can then be programmed to turn a set number of pulses into a pump/relay on-time in seconds.